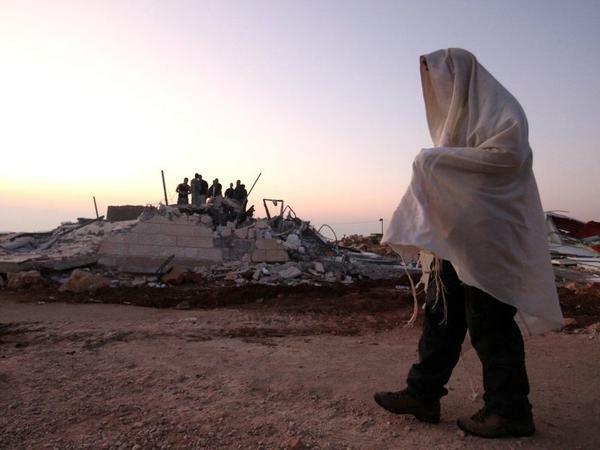 A Jewish settler wears his prayer shawl as he passes one of the structures demolished at the unauthorized Jewish settlement outpost in Ramat Migron, in the West Bank, on Sept. 5, 2011. Israel's radical Hilltop Youth have built numerous such outposts in recent years. 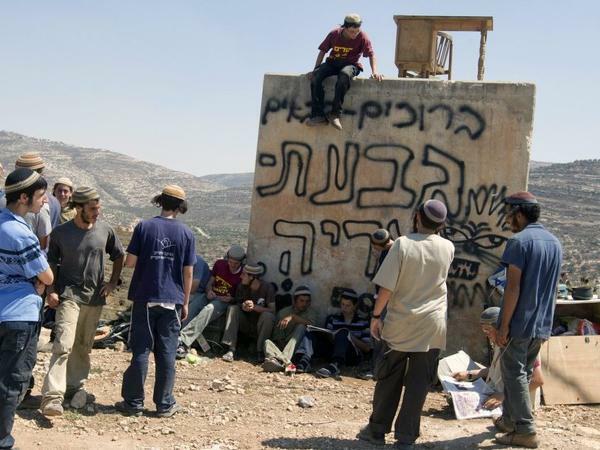 Jewish settlers, known as the Hilltop Youth, gather at an outpost at Itamar in the West Bank on Sept. 8, 2011. The youths were standing watch to see if Israeli security forces were coming to demolish the outpost. Israel's Hilltop Youth movement has been active for years, establishing Jewish settlement outposts on barren West Bank hills without bothering to get permission from the Israeli government. The Hilltop Youth occasionally received attention, usually when they damaged Palestinian property in the West Bank. But now they are in the headlines after a group of them raided an Israeli military base. Israel has charged five settlers as part of a promised clampdown on extremist Jewish groups. The Hilltop Youth seek to settle what they claim is all of the land of Israel, though it includes territory in the occupied West Bank, which the Palestinians want for their future state. One such outpost, Ramat Migron, is on a hill with a view through the olive trees to the mountains of the West Bank. It's cold and spartan, with only a few makeshift dwellings. It doesn't really seem like much, but the Hilltop Youth hope this tiny camp will eventually expand into a recognized settlement. Many settlements started this way, with just a few shelters, followed by trailers as more people move in. Eventually the whole area is built up with formal homes, schools, roads and electricity. Ramat Migron was the scene of scuffles between the Israeli security forces and members of the Hilltop Youth back in September. In video posted on YouTube, police are seen pushing two young settlers away as the camp is demolished. Now, it's been rebuilt by the same people. For years, radical settlers have been carrying out what they call "price tag attacks." They say that for every outpost demolished by the Israeli military, they will target the Palestinians in revenge . However, in mid-December dozens of extremists broke into an Israeli army base instead, vandalizing army property. It shocked the country, and the Israeli government could no longer ignore what was happening. "I see this as homemade terror, Jewish-made terror which is unacceptable," says Defense Minister Ehud Barak, using language that was usually reserved for Palestinian terrorists. The Hilltop Youth consist of Israelis in their teens or early 20s. Many became active after then-Prime Minister Ariel Sharon evacuated all of the roughly 8,000 Jewish settlers from the Gaza Strip in 2005. Many in the settler community felt betrayed that their country forcibly removed them after initially sanctioning their presence in Gaza. Sharon himself had been a leading proponent of settlements for decades. "We believe that all of the land of Israel belongs to the people of Israel and that's the reason I'm going there," says Liat Weisel, a fresh-faced 19-year-old with a ready smile and a confident manner. Weisel says that once a week she and other Hilltop Youth meet with a rabbi in the West Bank city of Hebron. A few hundred Jewish settlers live in the city in small enclaves, vastly outnumbered by the more than 150,000 Palestinian residents. "We look at the situation and we evaluate where our presence would be most effective," she says. The decisions are not made haphazardly. The five settlers facing charges allegedly used classified satellite maps and gained intelligence on planned settlement demolitions from informants inside the military. Asked what should happen to the Palestinians, Weisel says: "We see them as the occupiers. They are not supposed to be there. They have 22 [Arab] countries of their own. This is our land. The ideal situation is that they should leave." And when asked about the "price tag" attacks against Palestinians, which has included burning mosques burned and destroying property, she adds: "Sometimes because of the need to settle the land of Israel things need to be done." She adds that she does not object to the attack on the Israeli military base. All these acts, in her view, are part of a Jewish holy war. Israel has charged five right wing settlers with helping to organize a raid on an Israeli military base. The raid happened last month in the occupied West Bank. Israel is making good on a promise to clamp down on extremist Jewish groups operating in the Palestinian territories. Among those groups is the Hilltop Youth movement. Their aim is to settle what they say is all of the land if Israel, including areas Palestinians want for their future state. NPR's Lourdes Garcia-Navarro reports from the unauthorized settlement outpost of Ramat Migron. LOURDES GARCIA-NAVARRO, BYLINE: So, I'm standing on a hill with a view through the olive trees in front of me to the mountains here in the West Bank. It's cold and it's Spartan. But it's this lonely outcrop and many others like it that gives the Hilltop Youth its name. The camp in front of me is only a few makeshift dwellings. It doesn't really seem like much but this is the seed from which the settlements grow. GARCIA-NAVARRO: The ideologically-driven hope is that this tiny camp will eventually expand into a recognized settlement. Many settlements started this way with a few makeshift shelters, then trailers, as more people who moved in and eventually, whole built-up areas with homes and schools and infrastructure. It's quiet here at Ramat Migron today but it's been the scene of scuffles between the Israeli security forces and members of the Hilltop Youth in the past. GARCIA-NAVARRO: In this video posted on YouTube, shot in September last year, riot police are seen pushing two young settlers away as the camp is demolished. Now, a few months later, it's been rebuilt by the very same people. For years, extremist settlers have been carrying out what are called price tag attacks; for every outpost demolished by the army, they target Palestinians in revenge. Recently however that changed. In mid-December, dozens of extremist settlers broke into an Israeli army base instead, vandalizing army property. It shocked the nation and the government could no longer ignore what was happening. GARCIA-NAVARRO: Defense minister Ehud Barak used a word that is usually only reserved for Palestinian action: I see this as homemade terror, Jewish-made terror, which is unacceptable, he says. The face of what Barak calls Jewish terror is unexpected. In another settlement in the West Bank, a fresh-faced 19-year-old, who is a member of the Hilltop Youth, agrees to meet with us. Liat Weisel has a ready smile and a confident manner. GARCIA-NAVARRO: We believe that all of the land of Israel belongs to the land of Israel and that's the reason I'm here, she says. GARCIA-NAVARRO: Like many in the Hilltop Youth movement, she joined after then-Prime Minister Ariel Sharon evacuated the settlements in the Gaza Strip in 2005. Many settlers felt betrayed that their country forcibly remove them from their homes, after initially sanctioning their presence in Gaza. So the Hilltop Youth have been fighting back. GARCIA-NAVARRO: Weisel says once a week we meet with a rabbi in Hebron. We look at the situation and we evaluate where our presence will be most effective. The decisions are not made haphazardly. The five settlers that were just arrested are being charged with using classified satellite maps and gaining intelligence on planned demolitions from informants inside the military. What do you think should happen to the Palestinians? I mean, what is there role in this? GARCIA-NAVARRO: She says matter-of-factly, we see them as occupiers. They're not supposed to be there. This is our land. The ideal situation is that they should leave, she says. GARCIA-NAVARRO: Sometimes, because of the need to settle the land of Israel, things need to be done, she says. She declines to elaborate. She expresses no regret, either, over the attack on the Israeli military base. It's all in aid of what she sees as a Jewish holy war.